One of the best basil varieties to grow in pots, Greek Basil has very small leaves. It is very fragrant and Greek Basil is the variety best suited to dryimg. Usually grown as an annual plant, the botanical name is Ocimum basilicum minimum and it will reach around 25 cm in height,. being easy to grow, full of flavour and great for pesto sauce, you can grow Greek Basil from seed, or seedlings. A humus rich soil that retains moisture yet drains well. A position in full sun, although a little afternoon shade in warmer climates is recommended. Prepare the soil well before planting. Use a good quality potting mix with 1/4 quantity of cow manure mixed through. In the garden add some cow manure and some blood and bone before plating. Plant seedlings after the danger of frost has past and the soil has warmed in spring. Seeds can be planted indoors earlier, or in a cold frame. Mulch lightly around plants in the garden. From sowing seed to germination should take around 1 – 2 weeks. From seed to planting out should take around 10 weeks. From planting out to harvest should take around 8 weeks. Greek Basil, (pictured top right) is also known as bush basil, especially in the United States, it is a real cut and come again plant, it does not develop the tough stems that some other basil seems to and still has that lovely aniseed flavor. Essential as an ingredient in Greek salads it is easy to grow and although it does not like really cold spells it does well from spring to summer and into autumn in most climates. You can grow it in the garden or in a container, in cooler climates the container is the way to go so you can give it some protection from cold spells by bringing it inside. Fragrant, tasty and really a versatile culinary herb that goes so well with any tomato dish. Interestingly basil is said to bring good luck in Greece, same as in Thailand, different plants but both bringing good luck. Plant some basil. 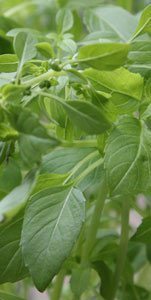 Smaller leaves, than the traditional basil, but easier to grow and not as fussy, pick a few sprigs, or a big bunch. Put a name to it Ocimum basilicum var. minimum. Works well with recipes that include, tomatoes, pasta, eggs, cheese and can be added to curries at the last minute. Can also be added to pizzas.